TINYpulse provides an ongoing employee engagement pulse survey to over 500 organizations worldwide. After analyzing over 200,000 anonymous employee responses, we arrived at one simple conclusion: work environments are lacking, but there is opportunity for improvement. Company culture is lackluster, direct supervisors need to step up their game, employees are undervalued, and there is a murky path when it comes to professional growth. Is it a wonder that Gallup found 87% of the global workforce to be disengaged? While diving deeper into the causes of employee dissatisfaction, we also uncovered significant opportunities to turn the tides. In particular, organizations that focus on organic, peer-to-peer recognition and collaborative work environments set a foundation for high employee engagement. Organizations that intentionally create an environment of recognition and regularly solicit and act on employee feedback enjoy a significant competitive advantage over organizations that think of employees as cogs. It’s time to ask employees what they need and want—you can be assured your competitors will. Nearly two-thirds of all employees report working at organizations that lack a strong work culture. Given research that shows the impact that strong work cultures play on financial performance, organizations that want to outperform their competitors would be wise to invest in their company culture. About half of all employees are highly satisfied with their direct supervisors. Poor communication, lack of knowledge, and limited employee interaction is harming supervisor-employee relationships. 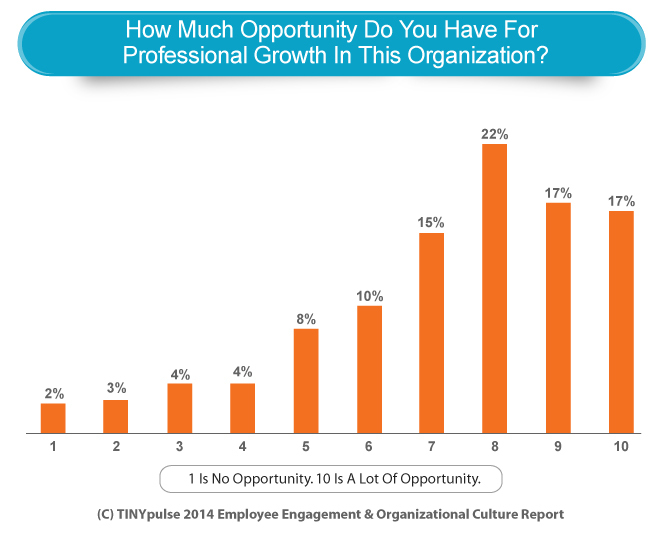 66% of all employees do not see strong opportunities for professional growth in their current role. Faced with unclear promotion paths and limited opportunities for mentorship and training, employees are uncertain about what lies ahead of them. 26% of employees do not believe they have the tools to succeed. Whether it’s lack of training or lack of resources, workers feel they do not have what they need to excel in their roles. Organizations are underperforming when it comes to showing how valued employees are, with only 21% of employees saying they feel strongly valued. Lack of appreciation and recognition is driving employees to feel undervalued. Given the premium Millennials put on feeling valued, this metric will only get worse. When offered the opportunity, 44% of all employees will organically give each other recognition on a consistent basis. Relying solely on supervisors to offer recognition to subordinates is outdated. In today’s increasingly global business environments, there is a growing need to enable and encourage peer-to-peer recognition tools. 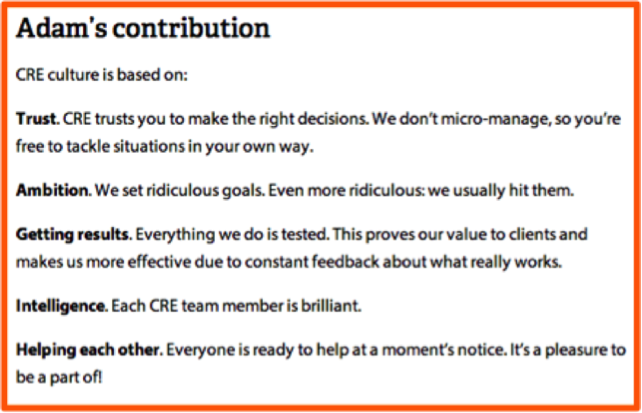 This decentralizes recognition and empowers all employees to recognize great work and effort. Peers—not money—are the #1 influence on their colleagues, and the source of 20% of all employees going the extra mile. Compensation is now viewed as just the baseline reason for taking a job. Camaraderie plays the true motivating role in encouraging employees to outperform expectations. "The thing I have learned at IBM is that culture is everything." Many employees spend over half of their waking hours at work, so why wouldn’t they want to be happy and work at a place with a great work culture? The sad reality is that only 36% of all employees rated their organization as having a strong organizational culture. Not only is this bad for employees, but poor work culture is also a drag on an organization’s ability to compete and outperform their competitors Wharton Professor Alex Edmans found that companies on Fortune magazine’s annual list of "100 Best Companies to Work for in America" returned 14% per year on their stock, compared to 6% of the overall market. Companies that do not invest in culture perform worse, financially, than those companies that are culturally-minded. Perhaps even more remarkable is that strong work cultures enable companies to weather downturns far better than their counterparts. The Workplace Fund, an investment fund created by Parnassus Investments comprised of American firms proven to have outstanding workplaces, has consistently performed strongly. In fact, during the height of the Great Recession, the Workplace Fund offered up a 10.81% return, compared to a 3.97% return from the S&P Index. Jerome Dodson, founder of Parnassus, notes in an interview with Fast Company, "I think what happens when you have a contented workplace, people are willing to put out more effort to improve operations during really difficult times. While I think every organization has their ups and downs, the downs are not as pronounced because everybody pulls together to try to get through the crisis. And, of course, this consistently more engaged performance inevitably reveals itself in the firm’s bottom line." In short, culture matters. It impacts customer service, productivity, absenteeism, and financial performance. Organizations that fail to invest in a positive, collaborative culture risk being outperformed by competitors who have their pulse on this sustainable competitive advantage. Culture isn’t just about an organization’s leaders. It’s about the people that work in the organization too. That’s why TINYpulse client Conversion Rate Experts took a cue from the Zappos Culture Book and created their very own Culture Book. Rather than leave it to the CEO to describe organizational values and culture, Conversion Rate Experts asked each employee to describe the culture and what it meant to them in their own words. They then compiled it into their own Culture Book with input from all team members. One of the great benefits of documenting their culture is that they leverage their Culture Book when recruiting for top talent. Candidates can now quickly ascertain if they can excel and mesh with the company’s norms and values. This saves both sides time and precious opportunity costs. Furthermore, almost every organization touts their culture, but Conversion Rate Experts can highlight how they live and breathe it every day versus a poster in the break room. Today, both executives and team members jealously protect the culture that they’ve been proud to create and improve on a continuous basis. When asked to rate the performance of their direct supervisor, only 51% of employees said they were satisfied. Why all this dissatisfaction and indifference? There are three clear issues that lead employees to rate direct supervisors poorly. Whenever a user anonymously responds to a TINYpulse question, they’re also able to explain their choice with qualitative feedback. Below is more context on why employees are dissatisfied with their direct supervisors, captured when they submitted their responses about their supervisors. But we shouldn’t just point the finger at managers. It’s time to take a step back and see how well we’re selecting and preparing managers to lead. Oftentimes, junior team members who excel in their role are then tapped to be the next supervisor. However, just because one is a great individual contributor, like a pharmacist, lawyer, or salesperson, doesn’t automatically make them a great manager. They studied and trained to be great pharmacists, lawyers, and salespeople, respectively—not supervisors. Do you feel that your manager has clearly defined your roles and responsibilities and how it contributes to the success of the organization? 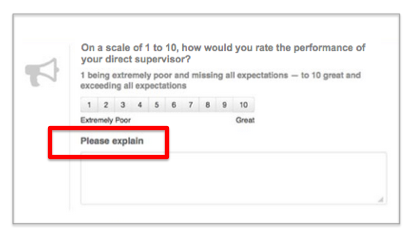 On a scale of 1 to 10, how would you rate the performance of your direct supervisor? Doing so will offer a clearer picture of manager performance and point to where you need to invest time and resources to help these managers inspire, and not demotivate, their teams. All organizations go through ups and downs. But sometimes those "downs" are so severe that they can cripple the business. This was the situation Jesse Proudman, Founder of Blue Box, was facing. After they decided to pivot the business, employees became gripped with fear, uncertainty, and doubt. They didn’t know if the company was going to survive, and if they would still have jobs. Jesse and his team decided it was time to give employees an anonymous platform to voice their concerns, and truly invest in listening and acting on feedback. Thanks to using TINYpulse and acting on survey responses, the management team was able to pinpoint employee concerns, act on them, and retain key talent. In the end, anonymous feedback provided by TINYpulse helped save their business. At the end of the day, company culture is organic and can improve or decay naturally over time. But, when companies like Blue Box give their employees a safe platform to encourage healthy dialogue, they can successfully overcome that natural decay and major organizational changes. When given the opportunity to rate their opportunities for professional growth, only 34% of all employees rated their opportunities a nine or higher, what would be considered a sign of strong opportunities. As we dive deeper into the qualitative feedback to unveil what’s driving this trend, we discovered that there are two fundamental insights that are driving this. First, there’s uncertainty over what those opportunities are to begin with. Second, there’s a lack of training and mentorship to be able to attain professional growth. On a scale of 1 to 10, how much opportunity do you have for professional growth in this organization? Do you feel you have the guidance and mentorship you need to grow professionally at our organization? Do you have the training you need to excel in your career? The first step in giving your employees clarity on their professional growth is understanding how well your organization is performing to date. You can’t come up with a plan until you know where you’re doing well and which areas your organization needs to shore up. "Leadership means forming a team and working toward common objectives that are tied to time, metrics, and resources." It’s so easy to assume that once employees are hired and onboarded that they’ll plug in and be productive right away. It turns out, however, that things aren’t so simple. 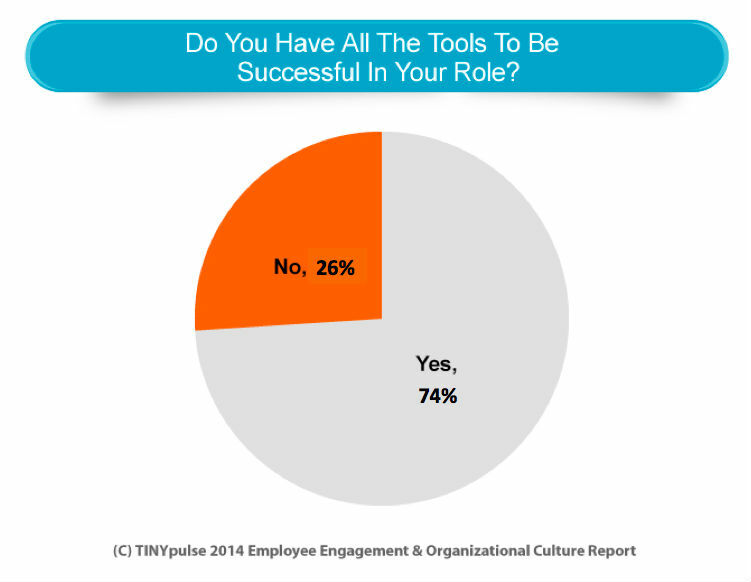 When employees were asked if they had the tools to be successful in their role, 26% of all respondents said "no." More than one in four of all workers feel like he or she is lacking the tools needed to move projects, and ultimately the organization as a whole, forward. Lacking the proper "tools" can be one of the most deflating feelings for a team member. What tools and resources are you offering your employees? Does your team have access to training and mentorship? Is the hardware in your office up to snuff? Are you investing in resources to make work more efficient? Are you even asking what your employees need? What’s amazing is when you ask employees what they need, they’ll tell you. But if you don’t ask, you’ll never know. You’ve spent time recruiting, hiring, and onboarding great employees. Don’t unknowingly shoot your organization in the foot by withholding the very tools they need to drive your organization forward. Survey anonymity is key to capturing candid employee feedback. But what happens when managers need to probe deeper into an issue that was brought up anonymously? Usually, they’re left to guess about the context or potential solution. 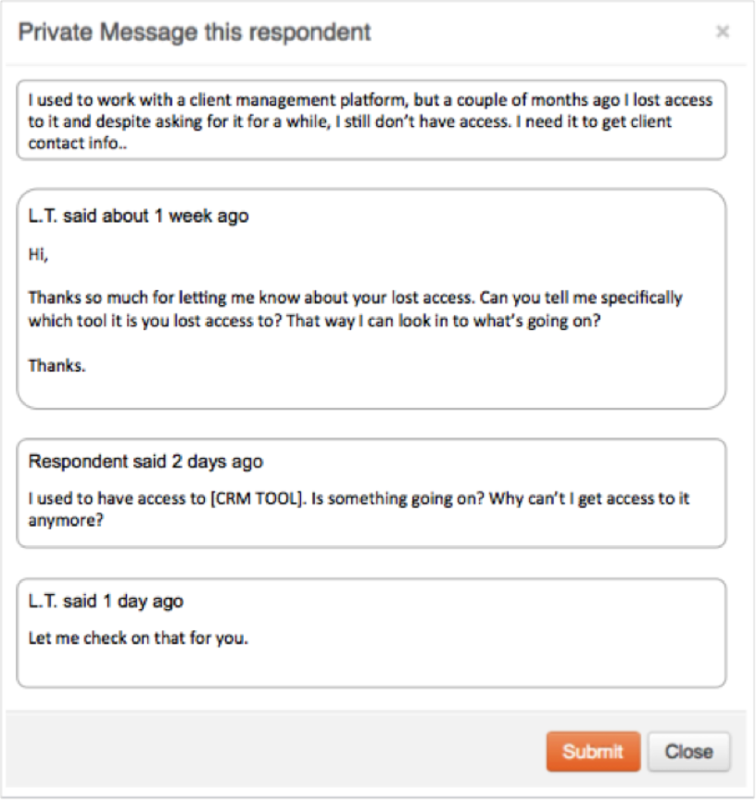 This is why TINYpulse includes a Private Message feature for just this scenario. It enables managers to reach out to respondents, but preserves respondent anonymity. It’s the best of both worlds: managers get the information they need while respondents preserve the anonymity they want. As it turned out, the organization was transitioning from one client relationship management (CRM) platform to another. This individual was not a regular user of the tool and was consequently not informed of the change. For managers, private messaging empowers them to probe deeper while honoring the anonymity of the employee survey, giving them a deeper opportunity to drill in on employee pain points. John Nagro, Director of Engineering at HubSpot, says it best: "I use Private Messages a ton to address positive and negative feedback. It's INSANELY POWERFUL." Ask employees how valued they feel at work, and the result is not impressive. On a scale of 1 to 10, only 21% of all employees gave a score of nine or higher for feeling valued at work. This means a whopping 79% of all employees are feeling marginally valued or extremely undervalued. 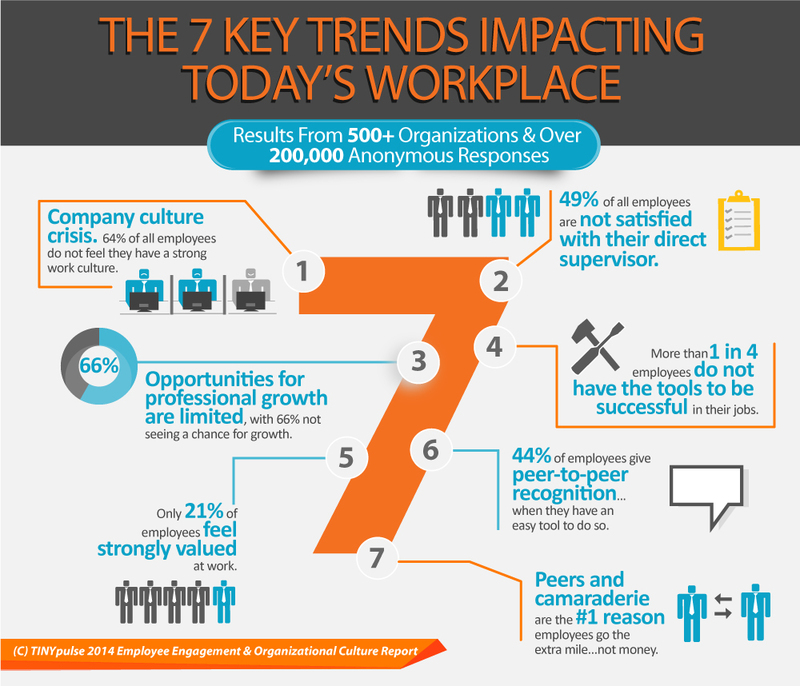 This is concerning news given findings from a recent report by Human Resource experts Bersin & Associates. They found that employee engagement, productivity, and customer service are about 14% better in those organizations where recognition occurs. And, when you consider the rise of Millennials in the job ranks, this dynamic become even more severe. As this PWC report highlights, Millennials expect to be appreciated and valued in their workplaces. And, they are willing to put a premium on culture and collaborative workplaces over financial gain, a major difference from their Gen X and Boomer counterparts. When you see these things happen, how does your organization show appreciation publicly and privately? Do you have an easy system to enable employee recognition? If you said "no" you're failing your employees. You are failing to recognize the efforts they make to contribute to a positive workplace. Plus you’ll be swimming against the current as the new generation of employees, like Millennials, demands more instant recognition. Start evaluating how your organization promotes and recognizes team members who go the extra mile with passion. "Everyone wants to be appreciated, so if you appreciate someone, don't keep it a secret." Employees are ready, willing, and able to give each other high fives. When offered a simple tool to do so, 44% of all workers will provide peer recognition on an ongoing basis. This recognition can be a Thank You for helping with an onboarding session, support on a late-night project, or appreciation for cleaning out the coffee machine. When employees are happy, they are even more inclined to offer up peer recognition. 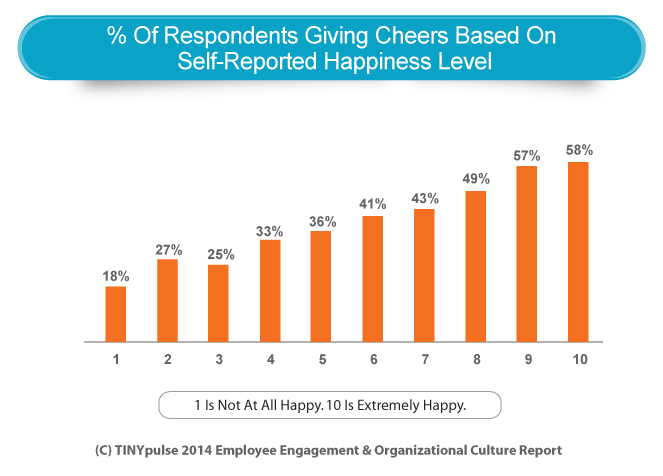 While only 18% of the least happy employees share praise, 58% of the happiest cohort gives cheers. Professional happiness encourages 3X more recognition! And when you consider that camaraderie is the biggest driver of going the extra mile, that recognition and social acknowledgement is too valuable to ignore. Remember that 79% of all employees are feeling undervalued due largely to a lack of recognition and appreciation. Consider then how important it is to have organic, peer-to-peer recognition enabled in your workplace. It expands recognition from being a manager-to-employee interaction into a company-wide interaction where everyone can contribute and send praise. Factor in that employees are more than happy to send each other high-fives, and you’ll find that if you implement a recognition tool that’s easy to use, it will actually get used and employees will feel more valued. It’s a virtuous cycle and one of the biggest bangs for the buck an organization can invest in. Recall that lackluster culture plaguing companies? Imagine how that changes when everyone is encouraged and empowered to spread positivity within the organization. Positivity begets positivity. While many companies are starting to leverage organic peer-to-peer recognition tools in their workplace, a few are taking it to the next level: they are publicly displaying that recognition for everyone to see. It not only promotes a healthy, supportive workplace, but it also shows prospective employees that this is a company that cares about employee recognition. Check out the original way that Wpromote, an online marketing agency, showcased the employee cheers received from TINYpulse’s Cheers for Peers recognition tool. They hung up individual cheers in the lobby to give everyone a boost of positive energy, and show recruits what a great culture they have. 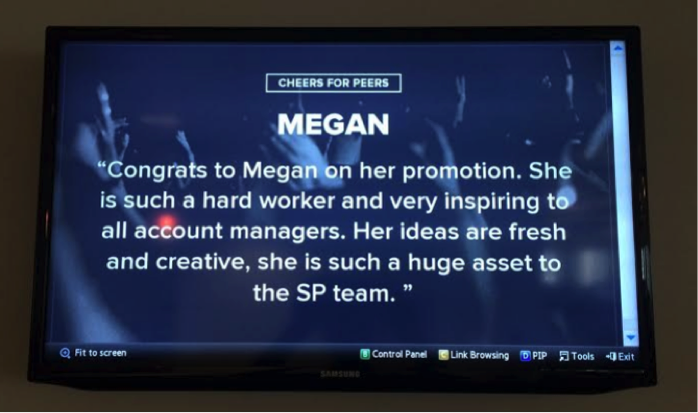 More recently, Wpromote went high tech and leveraged the Cheers for Peers API to broadcast all that great recognition in the employee break room. The screen scrolls through all employee cheers so that they feel appreciated each and every time they stop for a quick snack. Companies should keep thinking about how to raise the bar and keep pushing genuine appreciation and recognition throughout the organization. Happy employees and a vibrant culture become a sustainable competitive advantage when it comes to recruiting and retaining the best and brightest talent. We traditionally assume that money is what drives employees to work hard. Our research found that money doesn’t even crack the top five reasons employees go the extra mile! The real motivator is their peers. It’s been said, "If you want shiny, happy people, then hire shiny, happy people." Seems too simple, right? In today’s work environment, the impact of peers is too great to ignore, so organizations must start intentionally finding high performing and high culture fit employees. Further, organizations must be ruthless when it comes to rejecting individuals who aren’t a great fit. Even if they come across as a high performer, they can wreak havoc on the positive, collaborative culture you need to create. Given that peers are the greatest motivator for going the extra mile, it is incumbent on organizations to harness that energy so that it rolls into great work. This takes us back to leveraging peer-to-peer recognition tools like TINYpulse’s Cheers for Peers platform. Receiving a Cheers validates an employees’ work and shows that they are truly appreciated—so much so that recipients of Cheers will actually tweet about it! Companies looking for sustainable competitive advantages need look no further. Suppliers, software, and processes can be copied, but it’s nearly impossible to copy culture, like what Zappos, SAS, and Google have all created. It’s time for companies to take the first step and start asking. Ask your employees about how happy, frustrated, or burnt out they are. Don’t be afraid to probe and discover what about your workplace irks your employees, what gets them energized, and what they need to be successful. Creating a great company culture must be intentional. While it is a never-ending journey, it is a hugely rewarding one with immense, positive upsides for managers, employees, and ultimately organizations as a whole. This study analyzed over 200,000 responses from 500 organizations across the globe who use the TINYpulse employee engagement survey. Responses were pulled from August 15, 2013 through August 15, 2014. Julie Drzymalski - Data scientist consultant. Assistant Professor of Industrial Engineering at Western New England University. B.S, Polytechnic University. M.Eng., Widener University. M.S., Lehigh University. Ph.D., Lehigh University. Eric Gladstone - Data scientist consultant. Ph.D. Candidate, Cornell University. M.A., University of South Carolina. Laura Troyani - Marketing Director of TINYpulse, M.B.A., Harvard Business School. B.A., Harvard College. David Niu - Founder and CEO of TINYpulse. M.B.A., The Wharton School of the University of Pennsylvania. B.A., The University of California at Berkeley. A special thanks to the following people who also assisted in the development and production of this report: Stephen Becker IV and Skylar Broad. TINYpulse helps leaders get a pulse on how happy, frustrated, and burnt out their team is before employee become disengaged and retention becomes a nightmare. TINYpulse is a cloud-based, software-as-a-service that has revolutionized the annual employee survey by breaking it down to one question per week pulses to help leaders react quickly and gain insight into the health of their organization. The service also features virtual suggestions, an anonymous messaging system for employees to speak candidly with leaders, and Cheers for Peers, a peer-to-peer recognition feature that allows all employees to provide gratitude to their colleagues. TINYpulse helps hundreds of clients all around the world, including HubSpot, GlaxoSmithKline, and Living Social better engage and retain their employees. 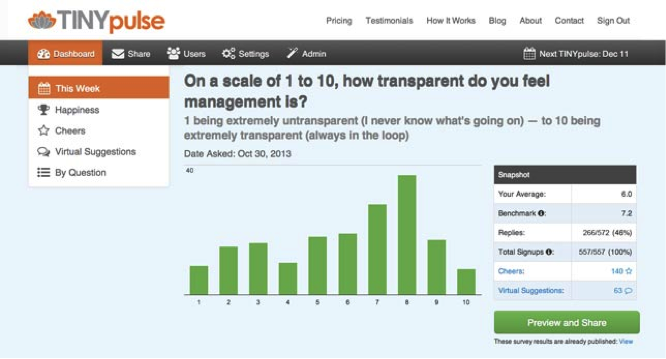 The following is a screenshot of a typical TINYpulse survey that employees respond to. 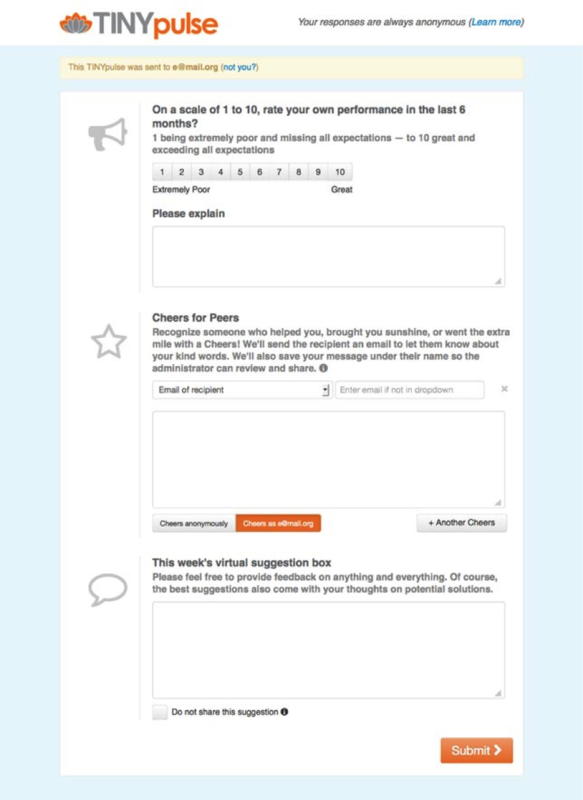 The following is a screenshot of the dashboard that survey administrators see.